Baylor offensive lineman Rami Hammad was arrested yesterday on a third-degree felony stalking charge, three weeks after a Baylor professor called 911 because he allegedly wouldn’t leave his ex-girlfriend alone, according to the Waco Tribune. The Tribune cites the arrest warrant, which details that Hammad was waiting for his ex-girlfriend before a July 7 class. She asked him to leave but he refused, and stayed until the end of class. Fearing for her safety, the woman walked with her professor to his office. Hammad followed and knocked on the door for several minutes. 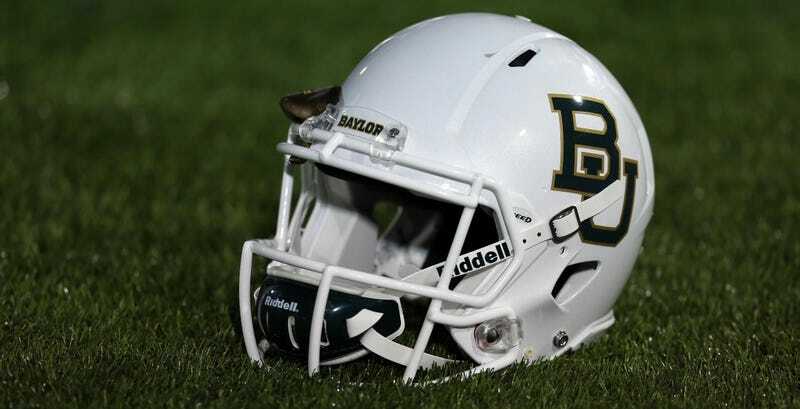 After multiple “unsuccessful” calls to Baylor athletics, the woman and professor called 911. Hammad told police that he was worried about his ex-girlfriend’s safety and just wanted to talk about their relationship, but she told police that the relationship had ended two months prior, and that’d she’d taken extensive measures to prevent Hammad from continuing to bother her. She also told police that he’d mentioned suicide and had physically abused her at least twice before, including grabbing her arm and pushing her against a wall inside of Baylor’s football practice facility. Hammad, a junior, played all 13 games last season, and was expected to start at right guard this season. Baylor told the Tribune that he was suspended from team activities until the resolution of his case. Two weeks ago new Baylor football head coach Jim Grobe said that Baylor didn’t have a “culture of bad behavior,” while the new Baylor athletic director said that he would make sure program was clean because he had daughters. This weekend the Associated Press reported that Baylor systematically discouraged women from reporting rapes and sexual assaults by threatening to punish them for drinking.